Add it to your summer reading list – Waking Up Joy is bound to leave you feeling refreshed and hankering for a glass of cool lemonade and a porch swing to sit on! Joy Talley is something of a wildcard in her family: predictable, but aloof. Though her siblings have all found matches, built families and careers, Joy seems to be stuck wandering the halls of spinsterhood… that is until she finds herself swinging from the end of a rope off the ledge of their ancestral home. Her stint in the hospital stuck in the loneliness of a coma breaks through decades long blockages which have prevented her from moving on with her life and letting love find her. But will it be the doctor or the ex-lover who whisk her away? Tina Ann Forkner has whipped up a truly original story that gracefully blends magic with faith, miracles with love, inspiring futures with dark pasts! There were moments when I wanted to shake the book as if I were shaking Forkner’s shoulders trying to squeeze out the bit of story she so methodically keeps at arms length. Oh, but I had the truth eventually… and so will you. It’s a training in patience and appreciation for Forkner’s ability to entwine mystery with budding romance – brava Mrs. Forkner, brava! Between the old family home, culinary masterpieces, charmed chocolates, and church pews my heart fell in love with this tiny town in Oklahoma and the people who lived in it. 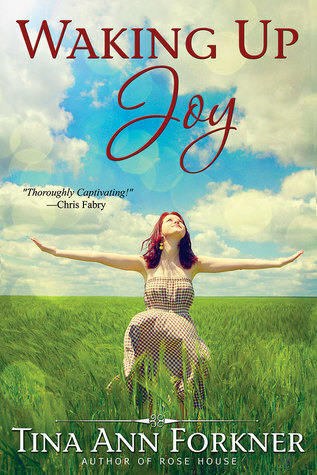 Waking Up Joy is captivating, funny, intriguing, and thought provoking. I highly recommend it to women young, young-ish, and not-so-young-anymore – there is something in here for everyone! I can’t wait until her next book, The Real Thing, comes out, but in the mean time I’ll certainly be picking up her other two, Ruby Among Us and Rose House!